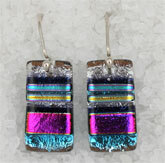 THE EARRING LADY is the source for Barbara Mellen's fused dichroic glass earrings, sold by over 200 stores from Maine to Missouri to Florida. Barbara Mellen and her sister Sarah Mellen handcraft both the glass beads and sterling silver ear wires. 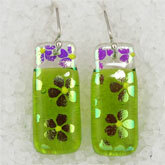 Almost all of the jewelry is made at least in part from DICHROIC GLASS. This glass has a high tech vacuum-deposited iridescent coating that appears to change color as the light moves from in front to behind it. The reflected color is most brilliant on a black base glass, but the alternate transmitted color can only be seen through a transparent glass. 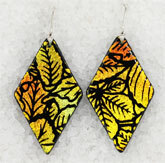 Both versions are used extensively in Barbara Mellen's earrings. Barbara is the glass artist. Choosing from several hundred AMERICAN MADE glass products, she cuts tiny pieces and fuses them together in a kiln. The results are usually cut into smaller pieces and fired again. Most earrings are fired twice, but some styles are fired only once and others three or four times. Sarah Mellen makes all the sterling silver pendant bails and earwires. She uses Argentium sterling silver, which is tarnish resistant and unlikely to cause problems for people whose ears are sensitive to regular sterling. She also prepares wholesale orders for shipment and welcomes retail customers. Elsewhere on this web site you can find the store nearest you. If you are traveling through South Carolina, please stop in. The Earring Lady is in Florence, very close to the intersection of interstates 95 and 20. (Directions available HERE.) Meet the artists, see what's new, and choose from hundreds of colors and styles.